Easy-to-usa, the Thompson T-100D is designed to maximize envelope print production on your RISO equipment. This model is fully automated and built-to-last. Its rugged construction and reliable service record means the Thompson T-100D is built for the long run. WIDTH: Between side covers: 16" Feeder Table: 11"
HEIGHT: Max: Feed Table 26", Min: Feed Table 22"
Easy to use, the Thompson T-100D is designed to maximize envelope production. Its predecessor model, the T-100, has assisted thousands of offset printers for over 25 years and it now has been re-designed to run on RISO printing systems. Its rugged construction and reliability make this feeder a valuable piece of equipment that will pay for itself many times over. Mailing houses and other variable data processing centers will find the T-100D will enhance data flow management and minimize production errors. Commercial printers will also recognize the benefits of running continuously at production speeds with no starting and stopping to reload envelopes. The feeder sets up quickly and is easy to operate. It loads from the top and feeds from the bottom to keep a continuous stream of envelopes to the RISO. Up to 500 envelopes can be loaded initially and more can be added at any time while the RISO is running. This eliminates wasted time from stop, load and go envelope printing. The T-100D is a free standing unit mounted on casters. The base height is adjustable to aid in leveling it to the RISO. 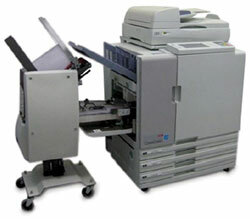 It can be set-up on or off in minutes and can be moved between various other RISO printing systems. When operating, the T-100D will stack approximately 15-20 envelopes under the infeed roller of the RISO, and the stack is controlled by a microswitch which keeps the stack a constant height at all times. As the RISO picks up envelopes, the microswitch allows more envelopes under the bottom of the stack. No timing device or hook-ups are necesarry and there is no need to stop the RISO until the job is finished. The feeder is shipped with side covers, front and rear stock guides removed. It can be fully assembled is minutes with only a Phillips head screwdriver and Allen wrench, both of which are provided. A training video is also included with the feeder.